NHP has announced it is bringing to market a range of low-powered, high-output intrinsically safe signalling products from Moflash that are ideally paired with the corresponding intrinsically safe barrier from GM International. This allows users to create easy, off the shelf KIT solutions for all signalling needs. The intrinsically safe protection method is based on the principle of limiting the amount of energy entering a hazardous area to below the level required to ignite the hazardous substances in the atmosphere. Intrinsically safe barriers limit the input energy for devices in hazardous areas, allowing the integrity of the intrinsically safe circuit to be maintained. 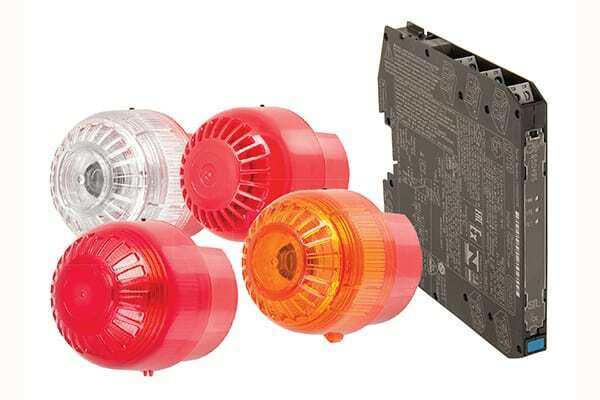 The Moflash range consists of a sounder that is 24VDC with a 105dB output, a beacon that is 24VDC with nine bright LEDs for high visual output, and the sounder/beacon combination unit. These devices are suitable for all hazardous environments and the solution is rated for hazardous zones zero, one, two, 20, 21 and 22 in IIC (Gas) and IIIC (Dust) environments. The devices also come with Group I certification for use in underground mining and are T5 and T6 temperature rated.